My collards have come up! They’re green and beautiful and tender and perfect and I love them. I mean, I always love collards, but tender young collards are the best, and I’m giddy seeing my garden bed bursting with them. One of my favorite ways to enjoy collards this year (second only to my holiday skillet of good fortune) is with bacon, onion, vinegar, shrimp, and a bit of apple cider vinegar. Throw them over a bowl of cheese grits and you’ll have my favorite meal of the season. 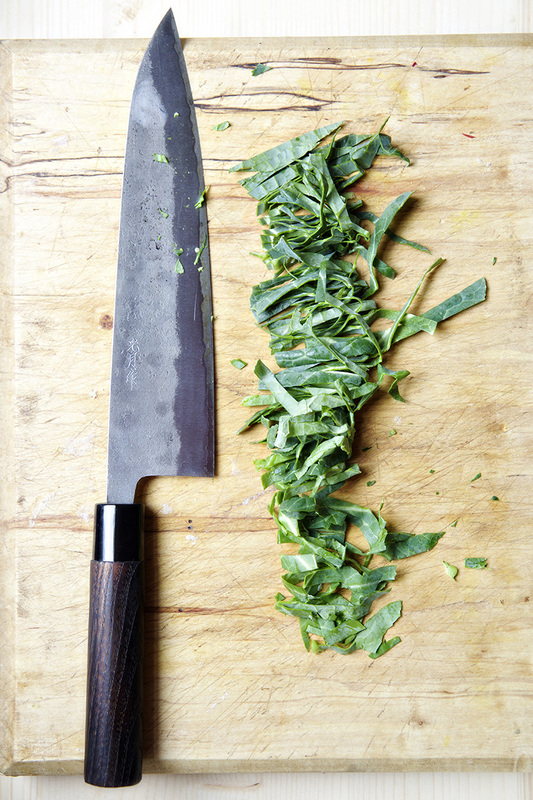 I’ve also taken to chopping my collards into ribbons, about 2″ long and 1/4″ thick, which I’ve determined (after many years of R&D) is the perfect size for cooked collards. This allows me to cook them in a skillet over medium heat with the rest of the ingredients for a relatively short amount of time, which means they aren’t plagued by sliminess or bitterness. 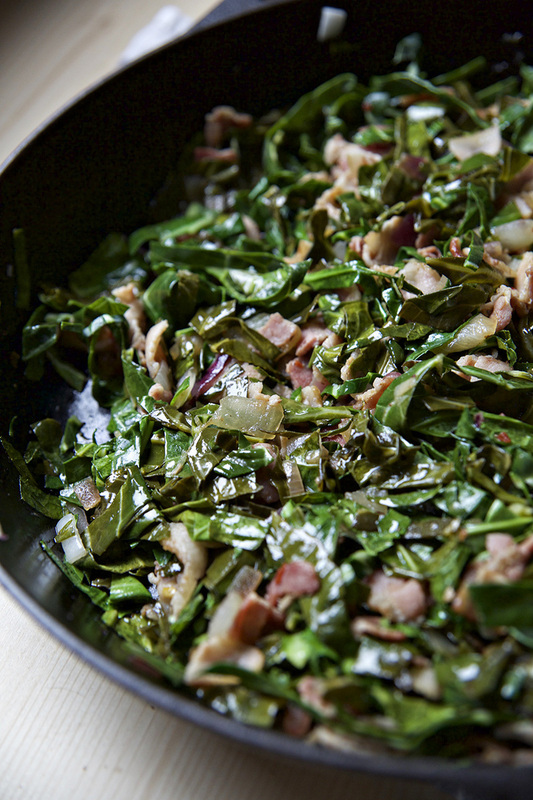 And since collards are happiest when they’re paired with bacon and apple cider vinegar, this dish has it all. Chop your bacon and start in a skillet with butter over medium heat. Dice your onion and garlic and add to the skillet, stirring together. Cook for 20 minutes or until bacon has crisped slightly and onions have begun to caramelize. While your onions and bacon are cooking cut the ribs out of the kale and thinly slice into ribbons. Mix into skillet along with apple cider vinegar, red pepper flakes, and salt. Cook, stirring occasionally, for an additional 15 minutes. Bring your water, milk, and grits to a light boil. Stir in salt and reduce to a simmer. Simmer, stirring frequently, for 20 minutes. Mix in cheese and lemon juice and stir well. 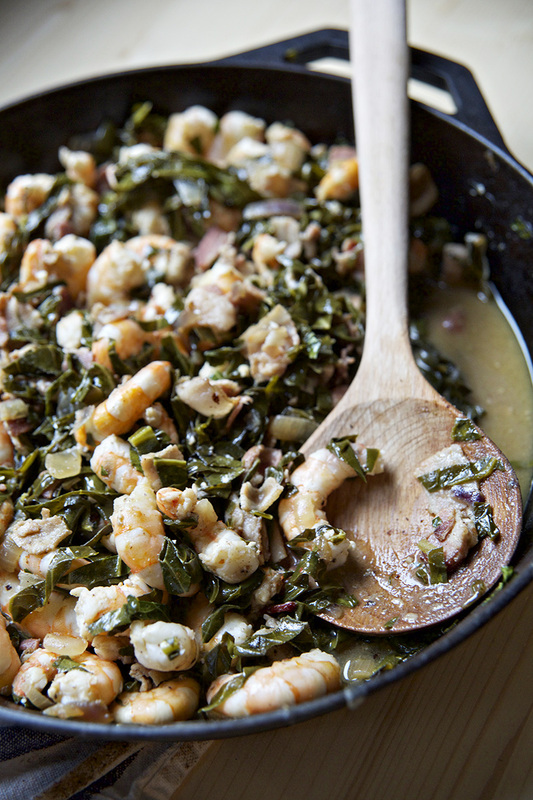 Clean your shrimp well and stir into collards. Continue to cook, stirring, until the shrimp are pink, 3-5 minutes. 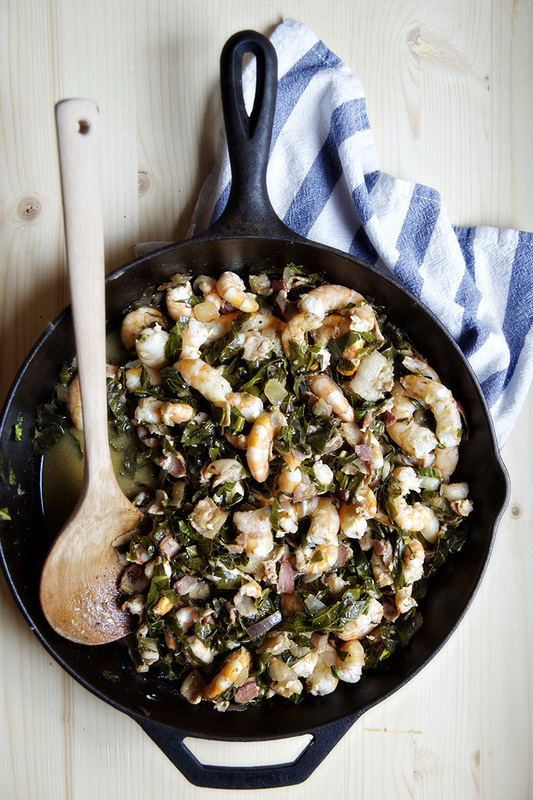 Serve grits topped with a heaping scoop of collards and shrimp and enjoy! Love everything about this recipe. I have to come to love shrimp and grits now that we live in Georgia. Yours are even better with the cheese and the collards! Being a northerner married to a southerner, it took several tries before I discovered I liked grits. And of course, adding cheese sure helps! I’m still trying to get on board with collards, but have been experimenting with other greens to get me there. This looks like just the recipe to get me over the collard green “hump”! Thanks! It took me YEARS to get my Yankee husband on board with all the things he eats now. He’s still not a shrimp lover, but I’ve got him on grits and greens. Keep trying! Apple cider vinegar is your friend! I thought those rutabaga grits looked great! I’ve never cooked grits, in fact I think I have only eaten grits once before when visiting my parents in Charleston, but this dish sounds SO amazing. Hoe can you go wrong with greens and shrimp cooked with bacon. This is my first visit to your blog, and I LOVE it!! Thanks for stopping by! Grits are the best- I’ve never served them to someone who didn’t love them (knock on wood). You really can’t go wrong with bacon! I spend a significant amount of time feeling angsty about my garden. WHY HAVEN’T MY PEPPERS SPROUTED YET!?! I’m excited for everything you have coming to you, and not just the vegetables! The flavors in this sound incredible … paired with those grits!! This needs to be on my table tonight! Big skillet full of yum is what ya have going on there! What a great use of collard greens, looks fantastic!